By late November 2010 the UK was gripped by another unusually icy winter and with the holiday season fast approaching everyone was watching the news and weather reports closely wondering whether they would be able to travel to their Christmas destinations. One of our Finnish members sent me a news items (and a smiley) that explained how Helsinki Airport manages to stay operational even in much harsher conditions than we ever experience here. The message was clear; the UK can learn from the experience of a country that deals with these conditions regularly. Whilst the UK isn’t exactly tropical and I have been diving in a drysuit since my open water course, this reminded me how much I learnt about cold water diving whilst teaching tec courses in Nordic countries. 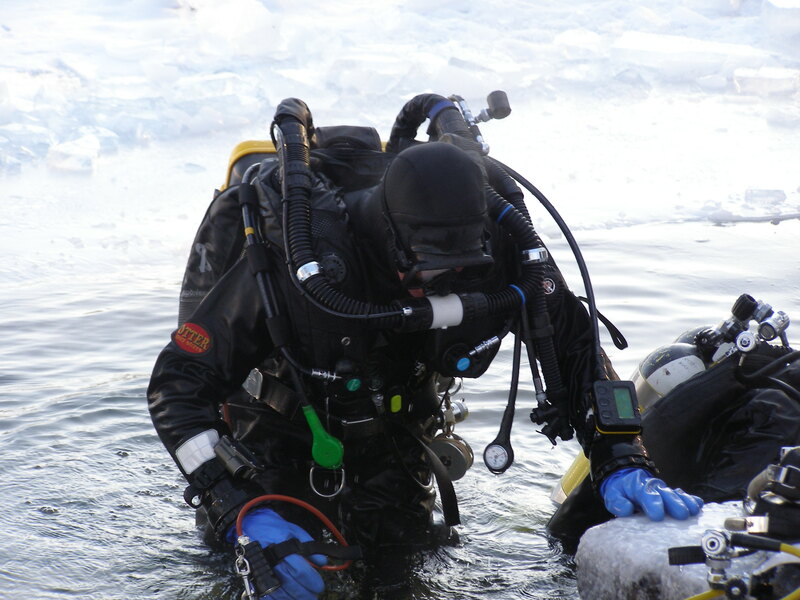 Some of the techniques are specific to extreme cold but I have adopted many others as part of my normal diving. It may surprise you to know that nearly every diver I saw in Finland dived in a membrane trilaminate drysuit (the others chose rubber). Whilst neoprene has the advantage of it’s own inherent warmth it has one distinct disadvantage – it holds water – a real problem in sub zero temperatures where everything freezes the minute you exit the water. 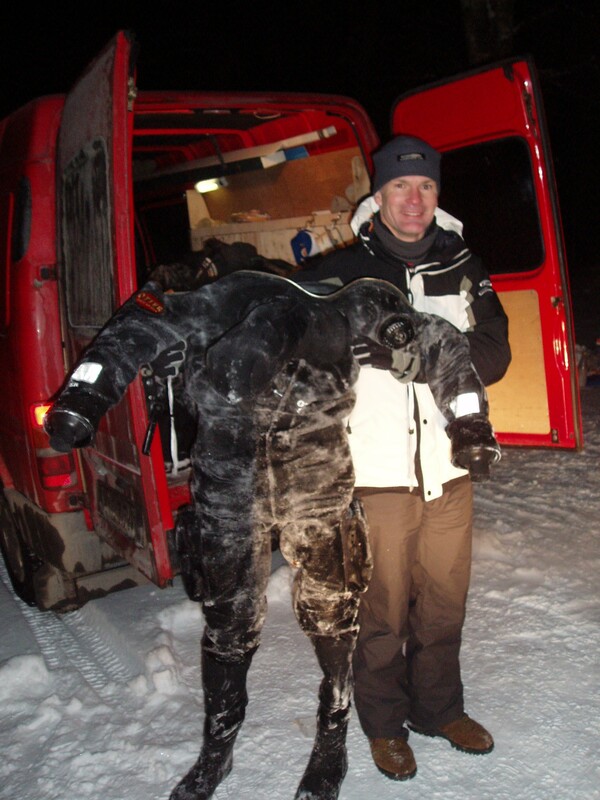 A membrane drysuit also allows greater variation of undergarments. There is a huge range of choice nowadays and layering is still a good way to match your undergarments to the water temperature and dive duration. When you are piling on the layers you should also make sure that air can still circulate. 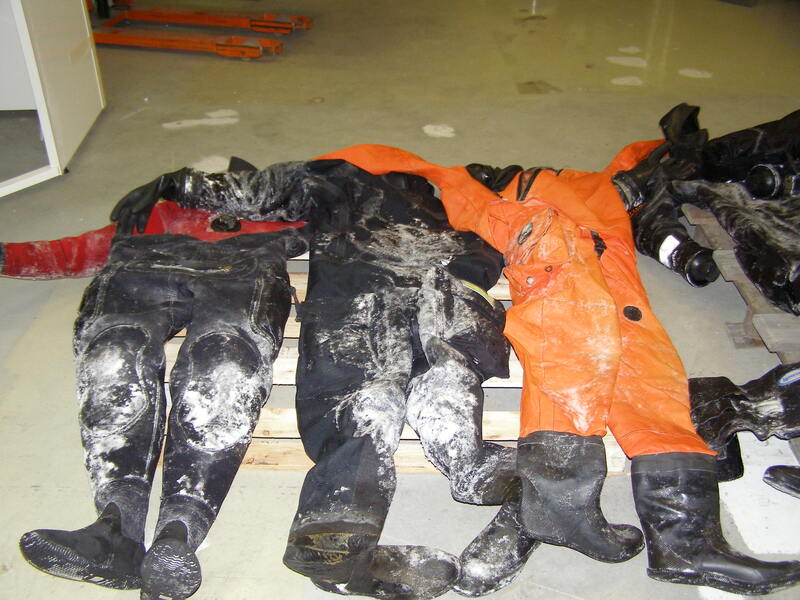 Not only does air need to get into and out of your drysuit but the value of the insulation provided by the air itself should not be underestimated. Drygloves may seem difficult to use but with practice they are no harder to dive in than wetsuit gloves. Changing to drygloves was the single biggest improvement in my enjoyment of extremely cold water diving. It does take a while to get used to putting them on and managing your equipment in them but after a few dives you soon adapt. Whichever gloves I’m using I put them on at the same time as my suit and then kit up. This gives me the opportunity to practice using them on dry land where I still have assistance if I need it. Be patient! The first few times my hands literally ached with the effort but once I was in the water it was well worth it. Heated Vests have improved in reliability and decreased in cost. Batteries have increased in efficiency massively and are no longer the equivalent of carrying another cylinder. As such heated vests are now a realistic option for many tec divers. Torch batteries can often be converted to run both your light head and heated vest. Some divers use both light and vest at the same time but many tec divers unplug their torches once the bottom part of the dive is over and plug in their heated vests for the decompression when they are most likely to cool down. P-Valves may not be something you think of when looking to keep warm but they are high on my list of cold water diving requirements. During long technical dives the need to urinate must be addressed and keeping hydrated helps, amongst other things, your body regulate it’s temperature. Nappies/Diapers are an easy option but can also contribute to the diver increasingly cooling down. P-Valves for guys are so easy that there is really no reason not to have one. For girls the availability of p-valves is fairly recent. There are a couple of designs and they take a bit more effort to “install” on your person but, for me at least, they are the diving invention of the decade. Whether you are male or female it’s quite common to have a few problems at first so have a chat with your TecRec Instructor – there are a few dos and don’ts. All these items are part of my standard equipment here in the UK. Even in the warmer months decompression can be very cooling so drygloves stay. Extreme cave dives may mean that a heated vest is welcome during long decompression even in water that would be considered warm for short duration dives. While i think it would be fun to tech dive in the arctic i prefer the sun, sand and sunshine!